Zucchini Tots, a photo by raylynntexas on Flickr. The original name for these was Zucchini Bites, which was okay. But when these were baking, they smelled just like tater tots. I changed up the recipe a little (by using seasoned bread crumbs,parm. cheese, & I drained the zucchini) so I decided to change the name too and called them "Zucchini Tots instead.And "tots" does mean small and these are small (baked in a mini muffin pan) so the name fits. 1. Preheat oven to 400F. Spray a mini-muffin tin with non-stick spray, set aside. 2. Grate the zucchini and then place in a dish towel to squeeze out the excess water- like when using frozen spinach; if you skip this part, the middle of the zucchini tots will be really soggy while the outside gets crispy and no one wants that. 4. Using a spoon or a cookie scoop, fill the muffin cups to the top. Bake for 15-18 minutes, or until the top is browned and set. >Egg Allergy? Try an egg-replacement product or a mixture of 3 tbsp water to 1 tbsp ground chia or flax seed (it will look gelatinous) and let it sit for 10 minutes before adding into the recipe. > Gluten Free? Try almond flour, coconut flour, cooked cauliflower, potato flakes, Corn Chex cereals (g.f), or cooked Quinoa. >Flavors: Like I do with any recipe I make, I adjust the ingredients to what I have on hand and what I prefer. You can add fresh herbs, use a different (or even dairy free) cheese, keep the skins on or peel the zucchini, add a bit of heat with red pepper flakes ,or even mix in bacon which on reader did. >No mini muffin tin? Some have just placed the mixture onto a baking sheet which has worked okay, but you can use a regular muffin tin. If using a regular muffin tin, fill the mixture to 1/2 full or a little less and press down using your fingers or a tbsp measure. Bake for 18-22 minutes and broil to get the tops crispy. >Salt: Salt helps draw out the moisture in foods which can help in this recipe. After grating your zucchini and placing it in a towel, sprinkle with salt, and let it sit for 10 minutes or so to draw the excess moisture out. Squeeze the towel really good to get as much of the moisture as you can out of the zucchini. >Freezing: I have not tried freezing these so I can't say how they will exactly turn out, but here it goes. Sometimes with zucchini that has been cooked, frozen, and reheated it can tend to be squishy so you have have to turn the broiler on for a few minutes. **RaeAnne said: "Made these and then froze them and it worked great. I think it is important to let them cool and then flash freeze them on a cookie sheet before putting them in freezer bag. We even reheated them in the microwave for about a minute on high or in the oven to make them crispier. It is important not to let them thaw before you cook them or it is a big gooey mess. " They DO look awesome. Must try! will it work if i omit the breadcrumbs? there are Gluten Free "Panko" style bread crumbs.Getting eaiser to find at regular supermarkets now. I use them in our stuffed mushrooms now. you could also use Quinoa as a substitute, I have made something similar with it and it's awesome!! I just tried this recipe but added more egg and Monterrey jack cheese because of the amount of zucchini I added.It turned out delicious! Thank you!!! 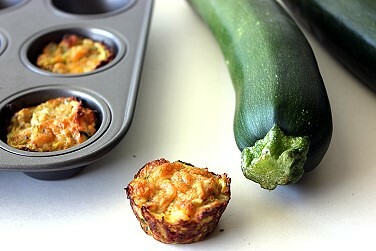 I am definitely making these- they look delicious and I love zucchini! Thanks for the recipe. I have made these several times and my pickiest 3 year old loves them and doesn't usually like any vegetables. I sometimes replace the breadcrumbs with rolled oats :)We find that cheddar is less salty than the parmesan when pairing it with seasoned breadcrumbs. We also found that no additional salt with the recipe as is is necessary. I used gluten free Corn Flake crumbs and it was wonderful! Erica: You could try using cooked rice or maybe even oats instead of breadcrumbs, but it needs some type of binder. Another thing you could try is unsweetened corn flakes, just grind them up before mixing in. Let me know if something else works in place of the breadcrumbs & how you like it. There is gluten-free panko out there in markets. I bet the panko crumbs would work. I think the version I saw had a rice base. you could also try almond flour. paleo. Crushed pork rinds should work. That's what I'm going to replace the bread crumbs with. Keeping it low carb! Has worked for me with chicken tenders. Crushed Fiber One Cereal would be good. I make "bread crumbs" by crushing Cheeros in the blender. You can even add seasonings if you want. The Zucchini Tots sounds fabulous! Have been looking for recipe for zucchini , we planted zuc. in our garden for the 1st time and they will be ready to pick soon. I will be trying wheat germ instead of the breadcrumbs. I'm thinking that quinoa flakes might work also. Rosemary i am going to try this looks great! I make my own bread crumbs with low carb bread or light style bread. Corn Chex and Rice Chex cereals are Gluten-free. I crush these up in place of bread crumbs now. You can add your own seasonings to make them Italian or Greek style or leave plain. thank you for all of the very helpful responses - i will see what i can find at the grocery store! i just put these in the oven, and they smell amazing! for now, i reduced the amount of breadcrumbs by about a 3rd, but i am excited to try the other gluten free products, as i like to try to go without if it's not noticeable (i think in this recipe it wouldn't be that noticeable to use a substitute). Cant wait to eat these - smells amazing! thanks so much for this delicious and super easy recipe. These came out great, im making them for the third time now. One of the only reasons I continue to turn on the stove in the summer. Gees, either follow the recipe or forget it. This was fabulous!!!!! Thank you! What is the cheese measurement? I'm assuming 1/4 cup? Can't wait to try these!!! I wonder if grated potatoes could replace the breadcrumbs. Husband can't do bread. Of course you can use a different cheese--personal preference! If I don't have a mini muffin tin like that can I just use a cookie sheet? Do you think they hold their form while baking? These look good but my daughter has an egg allergy. Is the egg crucial or is there something appropriate that you could substitute? Mine too... isn't it frustrating sometimes? I have done a lot of egg substituting 1/4 cup unsweet applesauce for each egg. If your recipe needs to rise also add 1/2 tsp baking powder. If the dish doesn't go well with fruit (few don't) you can use 2 TBsp water, 1 TBsp oil and 1/2 tsp baking powder for each egg. I am going to try these tots we'll see how they turn out! Good luck! you could also use Chia seeds. For one egg, soak One tablespoon in 3 tablespoon of water. It will be like jelly and works really well as an egg substitute. Have you tried your local vegan or health food store? They usually sell and egg replacement powder. I use one called 'no-egg' and you just use one teaspoon (+ one tbsp water) to each egg. My daughter says to use chia seeds for this one. We don't like using the Ener-G stuff, it tastes off and rarely makes a nice textured product. She uses applesauce or chia or flax for most sweet baked goods. My son can't have chicken eggs, but can have duck. Might be something worth looking into if you frequently find that you miss eggs. They are very similar for cooking (just a little bigger with more yolk). Apparently, being allergic or intolerant to one, does not mean you are you will certainly have problems with all eggs. I live in a rural area, so they are not to hard to come by here, but can sometimes be found a a whole foods store. Quail eggs seem to sub well but are very small, 5 or 6 to equivalent to 1 chicken egg. They can usually be found at whole foods or Asian markets. Milled flax seed is a great egg replaced. One tablespoon flax to three tablespoons water. Also pumpkin works great to replace egg oil and water in cake mixes. Kids never know the difference! Could you make without cheese? would you add more breadcrumbs? Denise: I think potatoes would work well. Also you could try oats or cooked rice. A: If you use a cookie sheet, try to pack the zucchini mixture by using a cookie scoop or your hands. They may not be as crispy or compact as using a mini muffin pan, but they should turn out good. Also you could try using a regular muffin pan and just filling it just below half way and adjust they cooking time. homestarmonkey: Maybe an egg substitute? I read an article that said you can use 1 tablespoon powdered flax seed soaked in 3 tablespoons water for every egg a recipe calls for. I haven't tried this so i'm not sure how it would work in this recipe. In some baking recipes I know you can use 1 banana or unsweetened applesauce in place of oils or eggs. Anonymous: Yes you can skip the cheese. You can add more breadcrumbs (maybe add in 1 tbsp at a time) until you get a mixture that isn't too wet, but not too dry. Do these need to rise? My daughter also has egg allergy. 1/4 cup unsweetened applesauce works great for baking dishes that do not need to rise. If they do (like cakes) you can add 1/4 baking powder to help them rise. My question is this a recipe that needs to rise and would the taste go well with a slightly sweet substitue for egg? No they do not rise. You could try applesauce, but I would use the all natural unsweetened applesauce. Let me know if it works out for you. These are so good!! After I ate one I couldn't stop. They only thing I did different was I sautéed the onions first and added some minced mushrooms for extra veggies. I used almond flour instead of bread crumbs and they were still delicious! I did have to use about 1/2 cup of almond flour instead of 1/4 cup though. I am making these, this weekend! Do you think they need to be eaten warm or are they ok, cold? These look so good. I love zucchini! Christina: I like them both ways, but I think warm is best. Anonymous:If you want them a day or two after you make them you can either leave them out or store them in the fridge. If you want to make them a head of time you can store them in the fridge and then reheat them in a 325F oven until they are warm again. You can also freeze them and they will last for a few months. I am so glad you answered this. I am going to make a bunch of these for our 4th of July picnic at the cabana. I only have the fridge and a microwave and the bbq, but would prefer not to use the microwave. It will be pretty hot at the beach, so I hope that just having them sit out in the sun will be good enough. Anyone try that yet? As an egg substitute I always use flax & water, it works great! Can't wait to try these this summer when there is sure to be an abundance of zucchini. Thanks for sharing the recipe! We tried them last night. My picky almost three year old still wouldn't eat them but we had fun making them together. We'll definitely be making them again and I may be adding a little carrot next time. Hey, have you tried freezing them? Since they are so easy to make, I was thinking I could make up a big batch for the freezer. Oh my gosh - these are so amazing! Just made them (they are cooling now) and ate two already - SO GOOD! I'm going to try almond flour vs bread crumbs. Mashed potatoes are a great egg substitute (2T per egg). VERY GOOD. I made them last night, double batch, and took to a friends house. A Big hit and they all got gobbled up. How many zucchinis did you need to equal the 1 cup? About 3/4- 1 zucchini, depending on the size. When I made this though,I had 1/2 a yellow & 1/2 green zucchini and so I shredded both to get 1 cup. Wow! This sounds just YUMPTIOUS! I just made these with cauliflower instead of bread crumbs. It turned out delicious! A little more eggy than I imagined, but good nonetheless! And perfect for my low-carb hubby! I'm making a pork fried "rice" using cauliflower and I was just thinking perhaps I could substitute that for the bread crumbs. Glad I'm on the right track...kind of new to being grain free. I bet using Quinoa instead of potato/rice/bread crumbs/flakes would work super well and make them that much more hearty and healthy. Going to try it! I made them with almond meal instead of bread crumbs, and they were delicious! Thanks Im going to try that too! DID YOU COOK THE QUINOA BEFORE USING IT? OR USE IT IN IT'S RAW FORM? Can't wait to try these during the zucchini months! Why do you lock your car in the city? So no-one can just open it up and take your stuff while you're away. Why do you lock your car in the counrty? So no-one can just open it up and stuff it with zucchini while you're away. I have know people who randomly do that. @erica - I have used ground almonds in place of bread crumbs in recipes and it works fine, often enhancing the flavor. I am going to try that with this recipe. Wish me luck! I made these today in my brand new mini-muffin tin! I added a little chopped spinach and cilantro and some red pepper flakes - just because. They turned out really well - I will share with my family soon! Those look so great! Looks like a bite size versions of the zucchini cake recipe my family has fallen in love with. I can't wait to try this. I just now made these and they are a little dry but could be because I didn't have onion, so i used onion salt and omitted the extra salt. Will try again and remember to buy a onion! Anyone have WW points plus for these? thanks. 8 points for the whole batch! I love this!! I just made these and they are yummy! They did not brown on top, just on the bottom and seemed a little "wet." I used gluten free bread crumbs, do you think that caused the problems? Love the almond meal suggestion. I think 1Tblsp coconut flour would also work, or just use another egg. For those who can use bread you might try a little bit of the Ezekiel cereal instead of commercial breadcrumbs if you don't make your own. In the oven right now. Can't wait to try them! What a good idea! I love zucchini fritters, but hate how long they take to make! I used almond flour instead of bread crumbs and they were delish! Thanks for the recipe! This comes at a great time, I have a zucchini I need to use up pronto! And I've got all the other ingredients too :) Thanks for sharing! So I tried this last night, and was kinda dissapointed to be quite honest... I'm not sure if I didn't dry the zucchini enough and it was still too watery. But the inside was still soggy, and left longer it just started burning. Maybe ommit the egg? How is it suppose to be like in consistency? I want to make this work! Also might try cheddar cheese instead of parmesan. Any insights would be great! Try drying them better next time...I used a thick towel and the moisture came all the way through...and if that doesn't work add a bit more breadcrumbs to the mixture until it looks just moist enough. Good luck! These look so yummy and easy to make!! Love the recipe but was curious to know the calorie count on these? Wow, what a fantastic idea! :) I got zucchini in the fridge, but I gotta make some bread crumbs! I can't wait to try! Thanks for posting! I have a "Passover" version in the oven right now - using matzah meal instead of the bread crumbs. My version is also egg & dairy-free (using daiya). Just tried these for an outdoor tea party and everyone loved them! I added a link to your recipe on my blogs for others to try! Thanks for sharing! I would love for you to check out the post! Made these tonight, they are delish!!! Very simple and very tasty, my favorite kind of recipe. Love all the substitution and recommended additions! I can't wait to try these. But do you put anything on them, when they're done? They look like they're begging for a spread or butter or something? Do they need it? To reply to gluten free ideas... I recently used the same recipe but used cooked Quinoa as a binder. Added a wee bit more cheese but it worked beautifully and were equally as yummy. My 13mo old can't get enough! These look amazing! I think I will sub Almond flour instead of breadcrumbs to make them gluten free! Thanks for posting! Gardencricket: Frozen zucchini would be fine as long as you defrost it before and make sure to squeeze out all of the water because I know that I sometimes shred the zucchini we have frozen for breads. These looks perfect! I love zucchini - the kids dont - so I'm always looking for ways to make healthy, yummy food. I'l throw some quinoa in for luck :-) Awesome recipe! Mmm, I may try these tonight. But I can't decide if I should try with quinoa or almond flour. Both sound like great gluten-free alternatives! can i add milk instead of a egg? How much quinoa would you use in place of the bread crumbs? If i wanted to make half a recipe would i still use the whole egg? Emmiiex3: Ok, what your gonna wanna do, is beat one full egg, put it in a container that tells the size, and then empty half the container, make sure you beat it so you get the white stuff and the yolk. -I wanna say that 1 large egg is about 3-ish tablespoons, sometimes 4tbsp depending on the manufacturer. A commercial Large egg is normally 1/4 cup of fluid so if you ever take an egg out you need to replace with that much applesauce or liquid. I just made these for lunch today. We used crushed corn flakes (we are out of bread crumbs) and these are wonderful! Little problem with them sticking in the pan ... will use more oil next time. EXCELLENT recipe! Definitely making these again. how would you adjust the time and temperature if you were to use a regualr muffin pan vs a mini muffin pan? That being said though, I loved this recipe and will be purchasing a mini muffin tin in the future...just for this! Who needs an air freshener when you have these baking! will definitely be including a link to this in a near future post!! I made these last night. Tasted really good. I needed to spray my pan and let them set a bit longer. A couple didn't make it out of the pan. Would try them again. Yum! if you use cauliflower as a binder instead of bread crumbs, how much do you need? the same amount of bread crumbs? Also, what would you be able to use a food processer instead of grating? Thanks! :) Can't wait to try them! Thank you for this recipe! It is so good. I'm going to start experimenting and use the pulp from my juicer next. Anon: I've been trying to come up with some recipes using the pulp from juicing both veggies & fruit, besides just giving it to our animals. We I get a few that I like, then I'm gonna post them. I have made fruit leather out of berry pulp. I didn't follow a recipe, but I'm sure you can find one. Awesome! Speaking of Tots, I wonder what they would be like with a little hash browns in the mix. These sound really good. Can you make ahead and freeze them? I found that when I am out of bread crumbs you can substitute Pepperidge Farm cornbread stuffing instead. Works great! You can use it direct from the package or if want a finer crumb, put in the food processor for a few seconds. Can't tell the difference! How many calories per serving? And how many in a serving? Wonderfully delicious recipe! I made it for the first time for supper last night, and it was an immediate hit. The little "bites" are just the right size for lunches. This is definitely a "keeper". Thanks. Just made these for the first time today...a double batch. YUM! For sure a keeper! Thanks! I can't stand the taste of zucchini, does the bread crumbs and cheese mask the taste of the vegetable enough to trick kids into eating it? If a kid can't tell it's healthy then I know my children and I will like it! I'm wondering if you have to use the muffin tin or if you could just plop blobs of this onto a cookie sheet before baking... Do you think the batter would be too runny? I think it would be ok. I made mine in the muffin tin but I'm going to just do blobs next time. My batter was loose but not runny. So so good! Already a family favorite! All I have left is grated zucchini in the freezer from last years garden. If I squeeze the liquid out, will this work and not be soggy? How much salt/pepper do you add? Cute - I've made something similar to these are they are delish. A great idea for a lunch snack. Jenny: You could try a regular muffin pan, just barely pack it. They need to be packed in order to stay together, but you could maybe cook a few on a cookie sheet to try. Amy: Let the zucchini defrost first before draining it out really good. Anon: I used freshly ground seasoning, so a few grounds or 1-2 pinches.Zucchini can be bland so you want enough to flavor it. Thanks for posting (found on pinterest). I'm looking for zucchini recipes to try for our farm market's annual zucchini smackdown. Wanted something different and easy for people to sample. This looks like a great one to try! Thank you for the recipe idea! (And thanks to your posters for substitution suggestions.) I used farm stand zucchini and green onions (scallions) instead of white. I also ground some almonds instead of using bread crumbs - great way to add protein and just a hint of nutty flavor. Just Lovely! Do u shred the whole zucchini skin & inside (seeds)? Do u shred the outside of the zucchini also & the inside with the seeds? I just made these and added shredded carrot as well, they were delish!!! This recipe is amazingly good! Perfect for folks that don't like veggies. Made these and LOVED them. Made a few adjustments to make them low carb. They remind me of stuffing! If I made these larger so I could bake them in ramekins would I change the baking time as well as increasing the ingredients? Delicious! All three of my kids loved this! It will be my family's new favorite side dish. Thanks! Made these last night and both my husband and I loved them. They tasted so much like the Hungarian stuffing my grandmother made for Thanksgiving and Christmas...and that taste triggered so many memories of growing up. Thank you! Next time I think I'll add some crumbled bacon. Everything is better with bacon!!! Bacon is one of the main reasons I could never go vegetarian or I'd be a cheating vegetarian who skips all meat except bacon. I made these last night for dinner, and they were yumtastic!! I didn't have a mini muffin pan so I just used a regular sized muffin pan and filled the cups about half way. I used all organic ingredients including panko breadcrumbs, fresh rosemary, basil, and oregano, and I used both cheddar AND parmesan cheese. I baked them for the full 18 minutes then set them under the broiler for a couple of minutes just to get the tops really brown and crunchy (I like it extra crispy!). They turned out like little cakes, kinda like crab cakes... And they were amazing! Love the idea & all the variations contributed. These look amazing. The skin has lots of nutrients & adds some color. Mine came out kind of quiche-y. I had two very small zucchinis so I doubled the recipe, maybe I used too much egg? I ate 2/3 of them and froze the rest- any reheating tips? what do you recommend for dipping? My kids are big into condiments - marinara sauce maybe? Or honey mustard dip as well! this recipe alone made me have to become a new follower. can't wait to read more. I made a double batch of these tots this morning. I used parmesan cheese and added a couple of shakes of Italian Seasoning. I am having a hard time not eating the entire batch in one sitting. Thanks for sharing the yummy recipe. How many zucchinis will equal one cup shredded? These sound wonderful. I will try my tortilla crumbs for a gluten free result. I am wondering how to make them dairy free and still good. Any suggestions? can't wait to try these! I will use tortilla crumbs to make them GF. Any suggestions on how to make them dairy free and still taste good? scrumdiddleeumptious: 1-2 depending on the size. I used 1/2 of one yellow and 1/2 green. Thanks for sharing! They are delicious! They even taste good the next day! Do you think there is a way to make this minus the egg or with something other than egg? I have a food allergy kiddo..???? I would suggest using a flax egg -1 tbl flax meal (ground flax seed) and 3 Tbl water. It helps bind and adds nutty flavor. You could also use agar agar or soy flour witht he same ratio to water. Those options do not taste as good. Really like the idea of zucchini tots! Do you have any ideas as to how they would hold up if used in lieu of tator tots in a tator tot casserole?! Just made these! I really hope my boys like them, if not I don't think I'll have a problem eating them all myself. They're sooooo good! do you think you could freeze these? thinking to use them as an appetizer, and would love to bake ahead of time. Super delicious. We've made two other versions. One with spicy sausage added and one with crab meat added. So freakin' good! Potato Flakes (I used Idahoan because they are GlutenFree) are a great substitute for breadcrumbs, although I just estimated the amount. Also, very good with garlic and oregano as well! Sounds yummy, I will be trying these this week! I am SO EXCITED to try this recipe! I'll be subbing in almond flour mixed with italian seasonings to make it Paleo…delish! One batch is equal to a serving? I used yellow summer squash and it worked well. We really liked them. Did you use a mini muffin tin Samantha? I squeezed my zuchinni but they were still quite soft in the middle after baking for 18 minutes....anyone else have this issue? They are delish though! I have this beautiful little purple eggplant. Do you think I could use it? Thanks for the great recipe. I found you via your picture on Pinterest. I reblogged about them. Tried to email you to let you know that I had linked back to you in my post to give you credit, but the email wasn't working. The kids loved them. Thanks, again. I made these not too long ago and they were soooo good! I have a lot of eggplants from our garden. Will give it a try. Will also try it with yellow squash. If you lightly salt the shredded zucchini and let it sit, it will shed more liquid. I made mine a bit smaller but otherwise followed the recipe to a "t" and they are excellent! They're great served with sriracha sauce! I made these with egg whites (3 Tbsp) instead of an egg and they turned out perfect - a little pale, though! Next time I'll use an orange cheese (cheddar) instead of parm, in order to get that gorgeous golden color in the picture above. Yum! Found this on Pinterest. Made with parm and panko crumbs. So tasty. A keeper. Thanks for sharing! I just made these!!! simple, quick and delicious!!! These were really good & simple to make - thanks for sharing! I didn't have the mini muffin tin, so I just rolled them into small balls and put them a cookie sheet lined with a baking mat & the turned out just fine. These are extremely tasty! Thank you. Pinning this for later. My kids love tots, so I will try these...THANKS!! Found this through Pinterest, made them, and they are AMAZING! Thank you so much for the yummy recipe. Can these be Frozen? that would be awesome! I'd just try them with zucchinis from my garden... and it was A-MA-ZING! Thanks a lot!! These are great - I used a regular muffin tin. We didn't wait for it to cool enough to take them out as "big" tots, it just became a bit of a mess. But that didn't matter - we loved it. Zucchini Tot Mess is a hit! I love this! My family is vegan so we used a flax egg (1 tbl flax meal with 3 tbls water) and nutritional yeast for the cheese. SO tasty! It is a amazing recipe !!!! I tried!!!! Thank you! It is really easier and so delicious! Anyone have any guesses on the calorie count for each tot? I tried the recipe and they are great! Love this recipe. On my third batch!